Most business internet connections are reliable for connectivity and speed. A majority of cable & DSL companies offer business internet connection with download speed of 5+Mbps & upload speed of 1+ Mbps, which is sufficient for the needs of a dental practice. Often we get asked: what if Internet is down? Firstly, the connection reliability for business internet has a reasonable dependability; mostly in order of 6-sigma, i.e. 1 in 1 million chance of going down. Secondly, it is easy to have a redundant connectivity option of data connected internet card for $20 to $30 per month. However, most practices don't need the latter option. 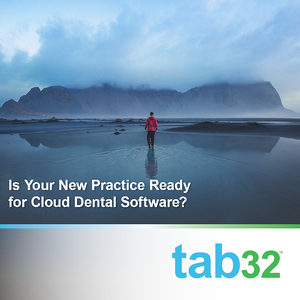 Scheduler and charting are the core components of cloud-based dental EHR. One must seek ease-of-use and simplicity in the software. Also, note that beautiful is not necessarily simple - do not fall into the trap! Images on cloud are MOST critical aspect of the cloud dental software because it eliminates the need of local server and storage for images. Most sensors out in the market provide bridging capabilities through imaging software and TWAIN driver. For detailed information on features, please review my earlier blog on features of dental software. Sending claims & attachments must be a part of your cloud dental software. c. Recall, incomplete treatments, etc. Lastly, patient management is most critical aspect for developing the long-term loyalty. The losses incurred by ignoring patient management might not be evident immediately but could seriously impact the future growth of a practice (See blogs on patient loyalty).